Born February 1968. B.A., Bridgewater State University, Massachusetts; MBA, De Montfort University, U.K.
Maziya discusses her wide-ranging career, including as CEO of the African Broadcast Network and later as an executive in infrastructure and mining concerns. She explains how the end of Apartheid in South Africa has enabled great business opportunities for those who had been previously excluded. Maziya also discusses her advocacy of girls’ STEM education. Tarun Khanna, Krishna G. Palepu, and Jayant Sinha, “Strategies That Fit Emerging Markets” [HBR article]. "Resource Nationalism: South Africa's President Tells ANC to Go Beyond Mines Nationalisation Debate," Metal Bulletin Weekly, June 29, 2012. "Top Players Lock Horns over New Deal in Mining," Business Day (South Africa), March 2, 2007. Video file of this interview available at Baker Library Historical Collections, histcollref@hbs.edu. Harvard ID holders can access the full-length video above. 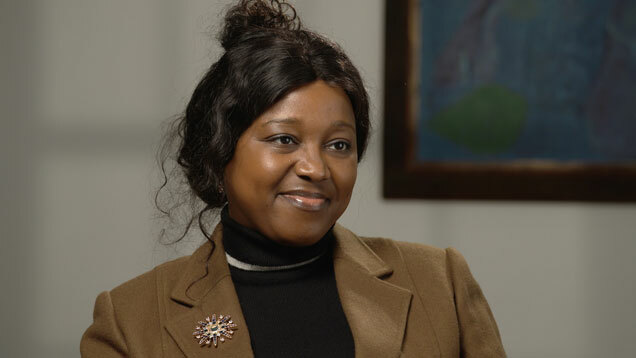 "Interview with Savannah Maziya, interviewed by Emmanuel Akyeamgpong, April 17, 2015, Creating Emerging Markets Project, Baker Library Historical Collections, Harvard Business School, http://www.hbs.edu/creating-emerging-markets/."